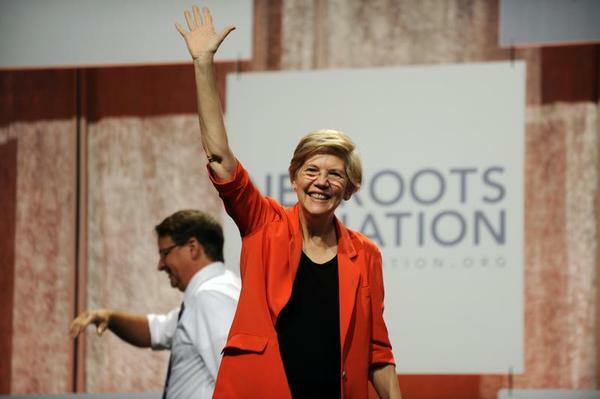 From the moment that Elizabeth Warren stepped on the stage to deliver her Friday morning speech at the Netroots Nation conference in Detroit, the chants echoed around the room. It was of no concern to the progressive activists on hand that Warren has insisted she is “not running for president” (though the denial is always phrased -- perhaps notably -- in the present tense). And it took more than a little urging from Warren, who repeatedly implored everyone to “sit down,” before the chant eventually subsided. For many in this crowd, it could not be clearer that this is Warren’s time to run for the Oval Office. And for anyone who might wonder what unique traits the Massachusetts senator would bring to a presidential run, her stemwinder of a speech served to answer that question. Waving her finger in the air like a sword, Warren delivered her populist harangue in a characteristically mad-as-hell tone that largely has been missing from national Democratic politics during the 6½ years of President Obama’s relatively staid and cerebral approach to speechifying. For them, it was precisely the kind of take-no-prisoners approach to pocketbook issues such as income inequality, student loan debt, and equal pay that fueled Warren’s rapid rise from the world of academia to consumer protection champion to the U.S. Senate. Just a year-in-a-half into her term, Warren has already become one of the most highly sought campaign surrogates for Democrats running in the 2014 midterms. Though conservatives have tagged her with the “Massachusetts liberal” label that has sunk previous White House aspirants from the Bay State, Warren’s particular brand of fiery populism has made her a hot commodity in some of the deep-red states where Democratic candidates are loath to be seen with President Obama. While Vice President Biden -- another potential 2016 contender -- also spoke at Netroots, there was no doubt as to who was the event’s real star. Just last week, a group of progressive activists launched Ready for Warren -- a presidential draft movement designed to stand against the already well-established pro-Clinton group Ready for Hillary. Despite her currently unmatched connection with the activist left, Warren’s appeal among the Democratic electorate at large remains miniscule compared with Clinton’s. In the latest RealClearPolitics average of national polls for the 2016 Democratic nomination, Warren sits at 7 percent -- almost 60 points behind Clinton (65 percent), and the Massachusetts senator doesn’t fare much better in Iowa or New Hampshire. By just about every measure, Clinton is in an even stronger position to become the nominee than she was at this time eight years ago. A Des Moines Register poll in June of 2006, for instance, not only showed Clinton to be vulnerable -- it had her trailing John Edwards in a hypothetical 2008 Iowa caucuses matchup. But Warren has little reason at the moment to concern herself with poll numbers. As Boston-based Democratic strategist Scott Ferson put it, the former Harvard professor is in the “perfect situation,” in that there appears to be little downside in spreading her message on the national stage. The institutional and financial advantages that Clinton would enjoy in a primary battle against Warren are difficult to overestimate. But while Democratic voters seem almost uniformly positive about the idea of a Clinton presidential bid, Warren could bring some sizzle to a race in which the frontrunner’s message might otherwise stagnate on the way to a coronation. In fact, a viable primary challenge on her left might be just what Clinton needs to hone her rusty political skills before the general election, as John Dickerson argues in Slate. Until it comes time to make that decision, however, expect Warren to continue to take advantage of the way the stars have aligned for her politically. Spending Bill Battles, Alliances: A Preview of New Congress?